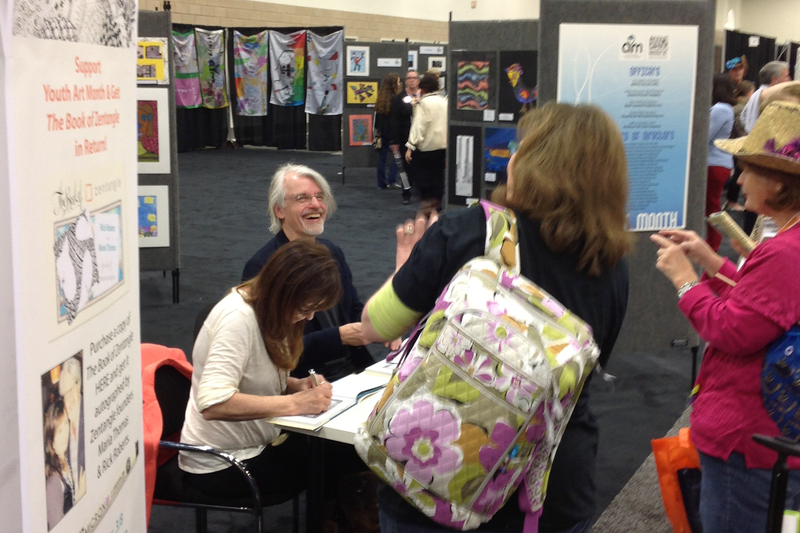 The loud BUZZ of tangling permeated the convention halls of the National Art Education Association (NAEA) convention (held in Fort Worth, TX- March 7-10, 2013) because the founders, Rick Roberts and Maria Thomas along with Molly Hollibaugh (Maria’s daughter) were there to promote the Zentangle method of drawing. 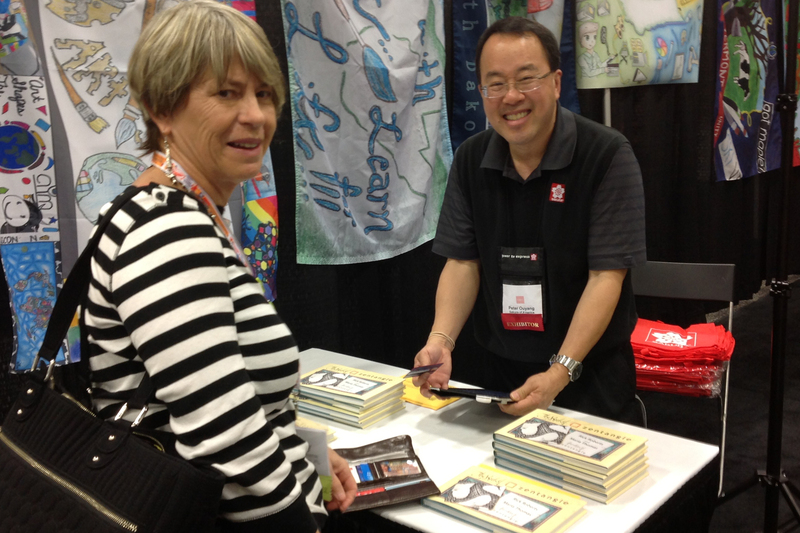 A Zentangle Fan buys her own copy of the Book of Zentangle from Peter Ouyang of Sakura of America. 100% of the proceeds went to Youth Art Month (YAM) donated by Sakura. 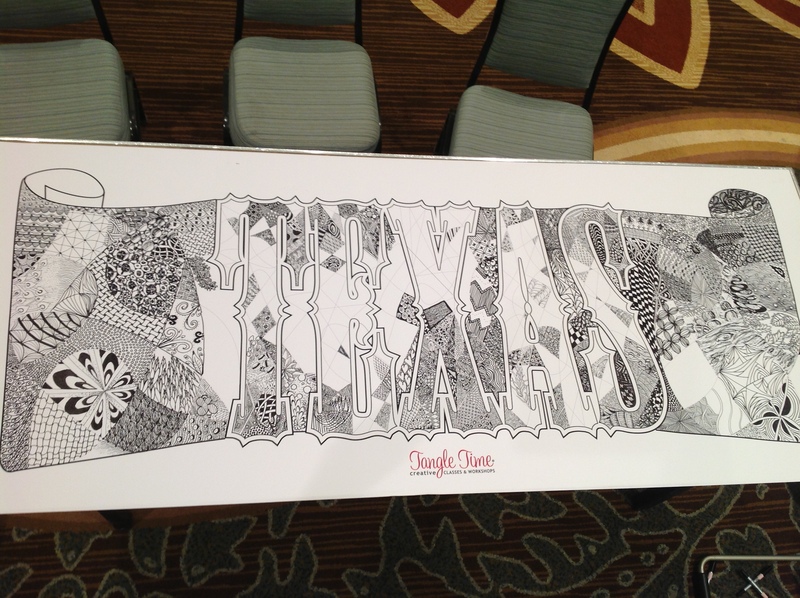 I ran a separate booth with Cayetano Olivarez and Kimberly Romano that was sponsored by Texas Lettering Arts Council. 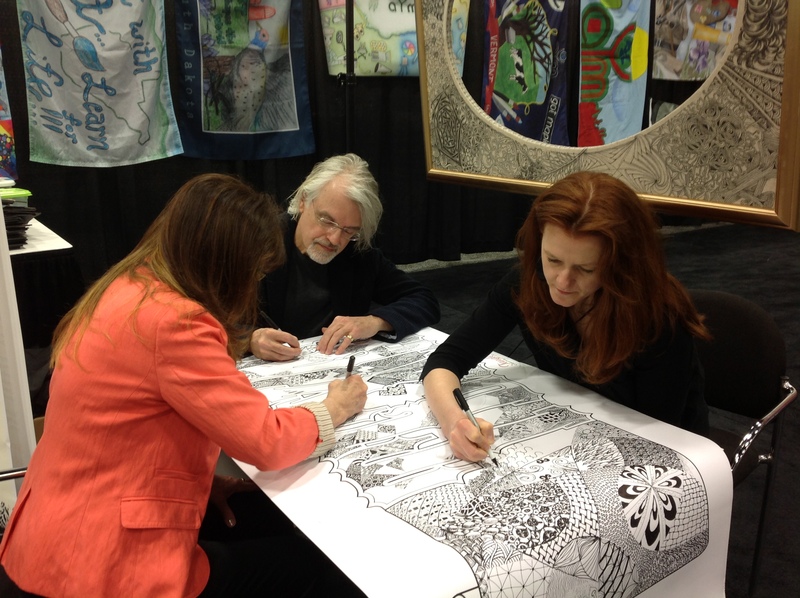 It was visited by many art teachers who brought Zentangle back to the classroom to teach their kids, and for personal enjoyment. 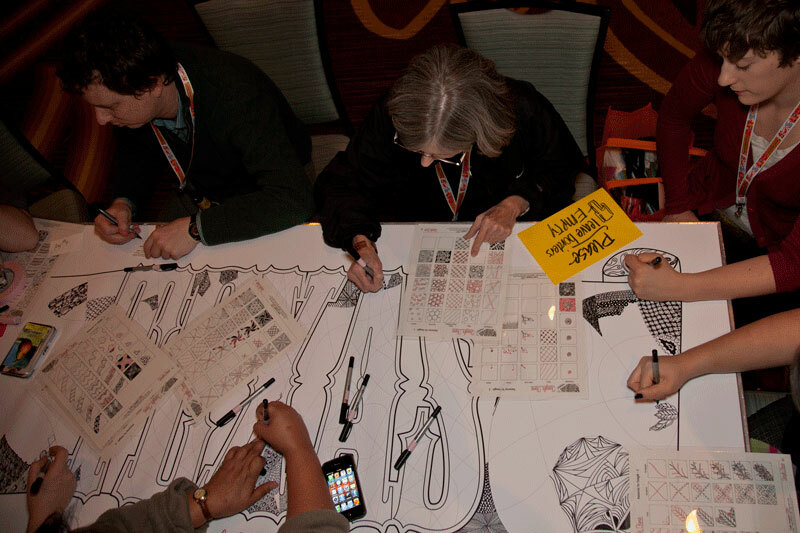 I also had the privilege of facilitating a Zentangle project to the NAEA participants on opening night from 7:00pm – 10:00pm and was busy with tanglers the entire time! Sakura of America donated their fantastic Identi-pen for the teachers to tangle with on the pre-strung, 6 foot banner. 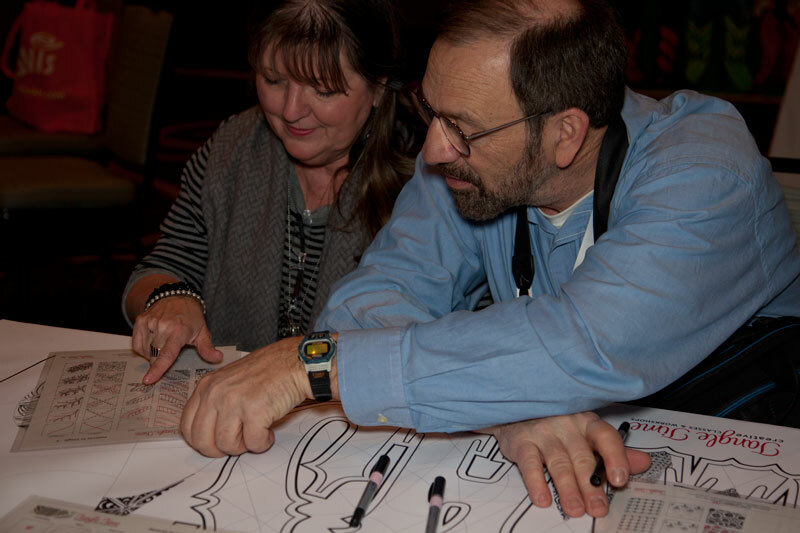 Dr. Joan Maresh Hansen assists another teacher with patterns. Rick, Maria and Molly tangle on the almost completed banner the next morning. Notice the oval frame cut out above Molly’s head. Maria tangled that frame and gave it to Sakura. So cool! 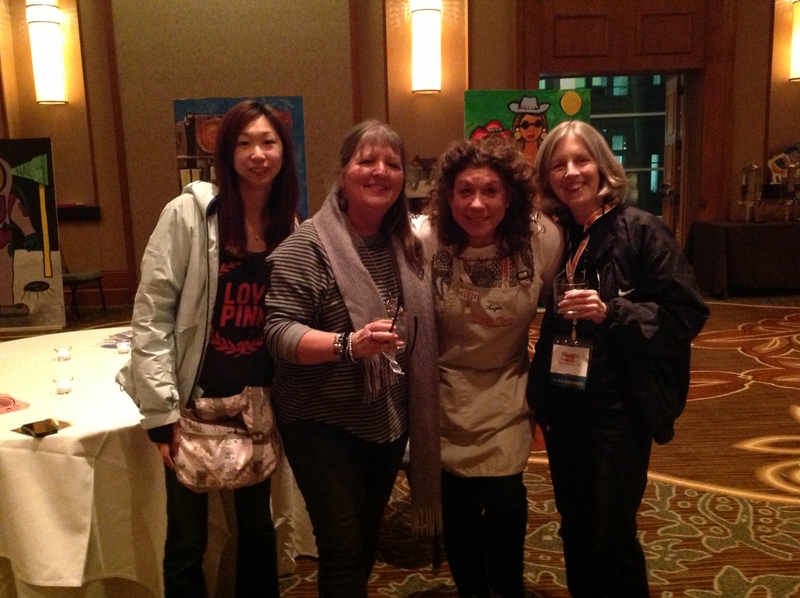 We all had so much fun – relaxing with the Zentangle method of drawing. Our booth featured creative ideas teachers can do with their students, like the Tangled States of America, String Starters® rubber stamps, Icosahedrons, Apprentice kits, pens, books, books and books that even feature my work! Tangled Letters and Zendala by Angie Vangalis, CZT featured in books published by Fox Chapel.